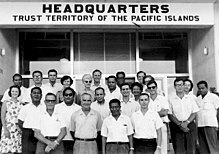 Four of the Trust Territory districts joined together and formed the Federated States of Micronesia in 1979, but the districts of Palau and the Marshall Islands declined to participate. Palau, the westernmost cluster of the Carolines, instead opted for independent status in 1978, which was widely supported by the Philippines, Taiwan, and Japan. It approved a new constitution and became the Republic of Palau in 1981. It signed a Compact of Free Association with the United States in 1982. In the same year, Palau became one of the founding members of the Nauru Agreement. After eight referenda and an amendment to the Palauan constitution, the Compact was ratified in 1993. The Compact went into effect on 1 October 1994, marking Palau de jure independent, although it had been de facto independent since 25 May 1994, when the trusteeship ended. Formal diplomatic relations with the Philippines was re-established in the same year, although the two nations already had diplomatic back channels prior to 1994. Palau also became a member of the Pacific Islands Forum. Legislation making Palau an “offshore” financial center was passed by the Senate in 1998. In 2001, Palau passed its first bank regulation and anti-money laundering laws. In 2005, Palau led the Micronesia challenge, which would conserve 30% of near-shore coastal waters and 20% of forest land of participating countries by 2020. In 2012, the Rock Islands of Palau was declared as a UNESCO World Heritage Site. In 2015, Palau became a member of the Climate Vulnerable Forum under the chairmanship of the Philippines, and at the same time, the country officially protected 80% of its water resources, becoming the first country to do so. The protection of its water resources made significant increases in the country’s economy in less than two years. In 2017, the nation became the first to establish an eco-promise, known as the Palau Pledge, which are stamped on local and foreign passports. In 2018, Palau and the Philippines began re-connecting their economic and diplomatic relations. The Philippines has supported Palau to become an observer state in ASEAN, as Palau also has Southeast Asian ethnic origins.